At the beginning of your upkeep, you gain X life, where X is the number of cards in your hand minus four. I'm calling this one "All Stars"
Here's the short version: (almost) any deck that was Standard or Type 2 legal at some point in time. Here's the long version: The format consists of card pools, and players can choose any of the available card pools from which to build a deck. Events would include decks that come from many different pools. 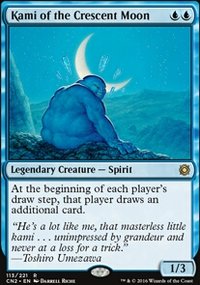 For example: you could easily see matchups like Fires vs Necro, Tinker vs Naya Lightsaber, Tog vs Gazi-Glare, Reanimator vs Turbo-Stasis, and so on. The advantages are many: first off, there will never be one dominant deck where half the meta plays it. I've played something similar to this; I used to have all the gold-border Worlds decks from every year and we used to play them against one another all the time. I can honestly say that as abusive as some of these were, they would all be evenly matched against one another. One in particular I remember: Ravager could beat Nether-Go consistently but it lost to Stars and Stripes or Prosbloom every time, both of which struggled against Nether-Go. It truly is the ultimate rock-paper-scissors format. 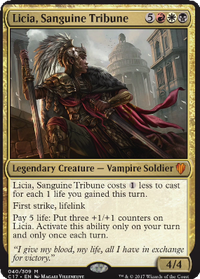 Second, it would mean you could keep you Standard deck when it rotates out and still have a format to play it in. 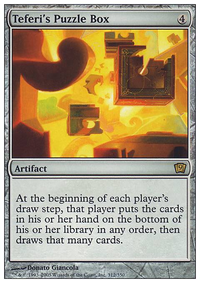 All the card pools are explicitly defined, though as a general guide think of a deck that was legal in Standard at the time it would have rotated out for the incoming block set. This is to keep things even. To say a 'Worlds' Standard used to work until they changed Worlds to happen at the end of the year. So that way decks in those card pools would have access to two full blocks. The next question is the 96 pool (Chronicles, Fallen Empires, Ice Age, homelands, Alliances, 4th Edition). First, to have a 95 pool would be redundant because it's the same pool minus the newer sets. So then 96 is the first pool. 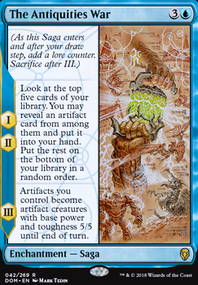 A lot of cards were restricted in that format: Balance , Black Vise , Ivory Tower , Land Tax , among others. We could take a serious look at those restrictions because some of those cards are really not that abusive for one and for two aside from a few stars the rest of the pool is pretty weak; realize that Elvish Archers was a tier-1 competitive chase rare worth a lot of money. Anyway so yes, each pool would have its own banned/restricted list. This may seem complicated. So many pools, so many cards to pick from. But if you just remember your old Standard deck, the one you locked away in the closet years ago because you didn't have the heart to dismantle it when it rotated out, it now has a format. Let's get this going hmm? Draw 1 for 1 mana... like Opt is not super broken. The card token is just that: a token that acts like a card in your hand. It doesn't do anything. It has no abilities. There's no type or mana cost or anything. What it 'does' I make you appear to have four 'cards' in your hand instead of three. You can discard it to Ravenous Rats , Merfolk Looter or whatever. It boosts toys like Ivory Tower or Library of Alexandria or something to that effect. If it's the only thing if your library you can draw it and not die. A card token has no intrinsic use, but it can be used by effects that use 'cards' in your hand. That's all. Most players run sleeves. Put the ad in a sleeve in front of another card. If not using sleeves find a junk common and write "buy my crap" on it. I card token is exactly that: a token card. It has no type, no mana cost, nothing. It's just a card. 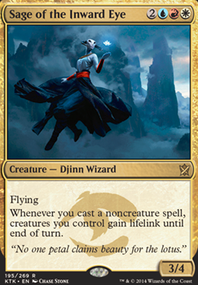 You can ditch it to a Merfolk Looter , gain life from Ivory Tower and that's about it. There is no way of putting it into play. This card is incredibly obnoxious. Used on an opponent, late in the game you're hoping to topdeck something useful and instead you draw a coupon for a free A/C check (freon not included). Use it on yourself after you been hit by Brain Freeze and you can't lose. As for it being red, it 'felt' like a goblin to me. The chaotic nature of the ability fits in red, no other reason. Angelheart Vial - comes to mind as a first pick if you are in a creature heavy meta. Bow of Nylea or Druidic Satchel - both have multiple uses, but the incidental life gain is fine. Elixir of Immortality - I put this in everything, kinda messes with seasons past though. Exquisite Blood or Polluted Bonds - these will get hate but have really good life gain potential. Retreat to Kazandu - for when you play lands. Lifegift - for when ANYONE plays a land. This card is super under rated in games of 3-4 players. especially against ramp decks. Ivory Tower or Ivory Crane Netsuke or Venser's Journal - trigger on upkeep, dependent on hand size venser is the better of the 3. Thoughtleech or Lifetap or Roots of Life - depends on your meta, i think there are more of these. Skullmead Cauldron - discard outlet on top of life gain. Tower of Eons - HUGE mana sink, but I have a special place in my heart for this card. Indeed having non creature life gain is very important. 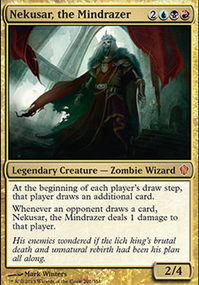 I run Ivory Tower , Blind Obedience and Tainted Sigil on that front. I could stand to maybe add in a couple of more non creature cards that gain life but my experience has been quite positive with this deck in my playgroup. This deck normally wins by playing a huge red X-spell like Molten Disaster or by draining the table with Exquisite Blood and Vizkopa Guildmage (they go infinite together killing the table but are also legit win cons in a multitude of other scenarios). Chandra's Ignition can also easily win the game with our commander or Evra, Halcyon Witness . Philoctetes I added the following cards because I already have them or they are cheap: Caged Sun , Ivory Tower , Thaumatic Compass Flip, Basalt Monolith , Clever Impersonator , Jin-Gitaxias, Core Augur , Viseling , As Foretold , Mystical Tutor , Swan Song , Terrain Generator . Ahh and I took this card Sunstone , because I do not have snows lands and ~27 are a little pricey for me. This is a cool deck. 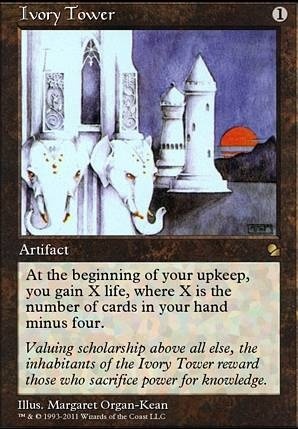 Ivory Tower- I loved this card back in my kitchen table days. Mystic Remora might also fit here.